One of the silliest doom-and-gloom stories you’ll hear these days is how we’re all going to be destroyed by debt. It’s just plain wrong—and letting this fear win could mean a crippling blow to your nest egg this year and beyond. In fact, it’s already caused one group of investors to miss out on a massive 265% return, as I’ll explain below. The easiest way to understand how the debt terror works is to bring it down to a single example. I like to use Mark Zuckerberg. Back in 2012, Zuckerberg got a mortgage for about $6 million. Now if I didn’t mention Zuck’s name and just told you that I knew of someone who took out a $6-million mortgage, you might think this person was terrible with money and headed off a financial cliff. But when I told you the rest of the story—that I was talking about someone worth tens of billions of dollars who’s the CEO of one of the world’s largest companies—that $6 million suddenly looks like nothing. 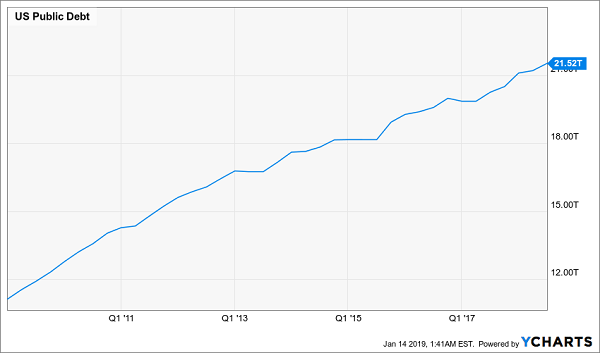 This is a pretty basic example, but it’s exactly how you should think when you hear pundits warn of the “trillions of dollars” in debt the US government has, or the massive debt bubble in corporate bonds, student loans or whatever hysteria they’re pushing. It’s all a half-truth, because they aren’t giving you the full picture. But I’ll always give you the full picture, so let’s dig into the details. That sounds bad, of course, and the number behind it sounds scarier. All told, $247 trillion of debt exists around the world. America owes nearly a tenth of that, with our $21 trillion of debt being called “a dire threat to our economic and national security” by National Security Director Dan Coats. But let’s look at the asset side. Is the world too deep in the hole, or does it have enough collateral to make its debt load manageable? This is a harder question to answer than you might expect. While there are many independent estimates of the world’s debt, there are few studies of the world’s wealth—again proving the bias toward fear when it comes to this issue. Part of the reason is that it’s tough to estimate the value of the world’s wealth. How much is the Taj Mahal worth? The White House? Yosemite National Park? How could one even begin to speculate about the value of the many wonderful cultural and historical artifacts humanity has produced across millennia? There’s another problem: some wealth is debt. Let me explain. Think of Zuckerberg’s $6-million mortgage. That was his debt, but it was also his bank’s asset. In credit, the debtor’s debt is also the creditor’s credit—meaning it’s classified as an asset held by someone else. For this reason, the world’s wealth must by definition always exceed its debt. Which is why the world’s wealth exceeds its $247-trillion debt by all estimates. One of the most respected estimates puts all of the wealth in the world at $317 trillion at the end of 2018—although that measure, by Credit Suisse, doesn’t include things like the Taj Mahal and the White House. So consider it a conservative estimate at best. So is the world overly indebted? 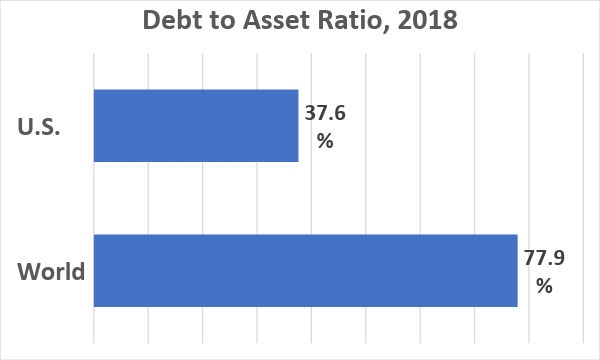 At that amount, the world’s debt-to-asset ratio is 77.9%. In other words, if the world had the median wealth of the average 50-year-old American, who’s worth $84,542, the world would owe $65,858—or maybe a car loan or two, and some credit card debt—but would have a paid-off house. Would anyone say someone with a debt-free home and a few debts is facing a financial crisis? Of course not. Things look even better in America. Because America owns $98 trillion of the world’s wealth, its debt-to-asset ratio is less than half that of the world average. In other words, America is one of the least indebted and financially healthy countries on earth. Again, put it in perspective: if America were the average 50-year-old, it would owe just $31,787. This is far from a crisis. Yet whenever I tell people this, they have a hard time believing it. All the time, we are told there’s too much debt and that we’re facing a crisis. That panic is simply wrong, as the data proves again and again. If this seems academic to you, let me assure you it isn’t. Fear of debt drives individual investors to make bad decisions, like buying gold out of fear that the next recession is just around the corner, as the gold bugs love to warn us. That’s why the yellow metal was especially popular at the height of the financial crisis in 2009. 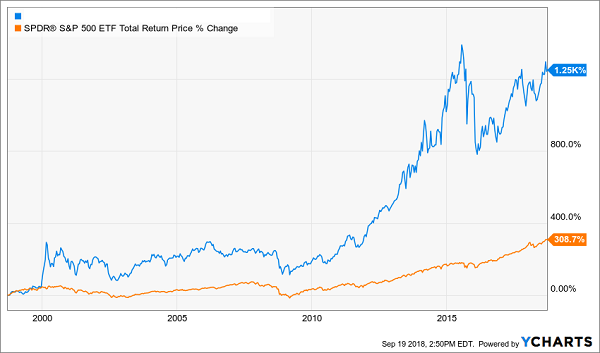 Trouble is, its return since then is pathetic compared to US stocks. But people listen because panic sells and it just sounds right that debt is bad. But these folks have missed out on a 265% return! That matters now because equities took a nosedive in late 2018, based on the fearmongers’ incessant warnings—but since none of those warnings are right (debt is actually manageable, earnings keep rising, wealth is growing faster than debt, incomes are up while unemployment is down and so on), stocks are beginning to recover. The bottom line? Now is the perfect time to buy stocks. Yours for 2019: Monthly 8.5%+ Cash Payouts You Can Count On! Don’t let unwarranted debt fears handcuff your profits in 2019. Instead, do what one savvy group of folks from across America is doing right now: ignore the hype and pocket an outsized 8.5% cash dividend! These investors are members of my CEF Insider service—a group you can join right now with no risk and no commitment whatsoever. As soon as you do, I’ll GIVE you the names of the 18 rock-solid buys in the service’s portfolio—all a special kind of investment called a closed-end fund (CEF). Taken together, they hand you that incredible 8.5% average payout! 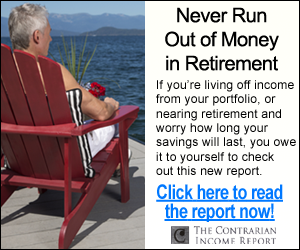 So a $400,000 investment would give you a retirement-changing $34,000 in dividend income—starting today. And remember, that 8.5% is just an average. 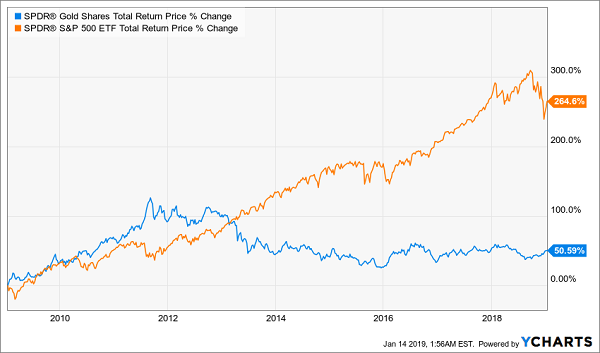 One of these blockbuster dividends yields an amazing 10.7% Another? 11.7%! Better yet, most of these dynamic funds pay dividends monthly—no more waiting three full months for your next cash payout! That’s not all: you also get a FREE Special Report revealing my top 5 CEF buys for 2019. These CEFs truly are the best of the best: your go-to picks for reliable income and blockbuster upside: in fact, I’m fully expecting 20%+ in price gains in 2019 alone, thanks to the ridiculous discounts they’re trading at right now. 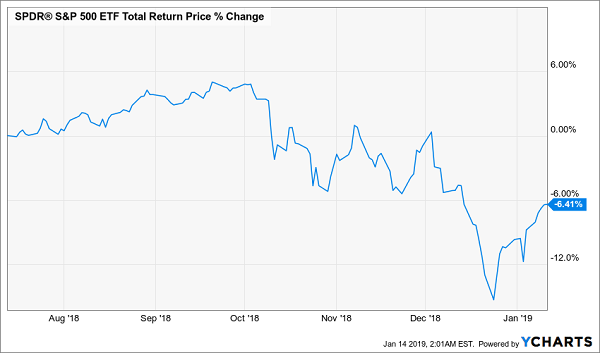 And with just a couple more clicks, the name of this fund, my 18 CEF buys throwing off an amazing 8.5% dividend and my 5 very best CEF buys for 2019 can all be yours. Don’t wait! These dynamic funds have already started to inch higher thanks to the rebound, so you need to move now. 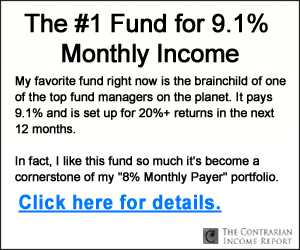 Click right here to get your Special Report and full details—names, ticker symbols and my complete research—on all 18 of my favorite 8%+ income plays!